Shutter Island, based on the Dennis Lehane (Mystic River, Gone Baby Gone) novel of the same name, is truly a B-movie with an A-list cast and crew. The latest endeavour of Academy Award-wining director, Martin Scorsese (Goodfellas, The Departed) is a creepy, tense, psychological mystery told in the pulp vain. I have a feeling had anyone else but Scorsese directed this material, it would could been an utter mess and disaster of a film. On the surface, the pulpy, somewhat dense, script by Laeta Kalogridis (Alexander, Pathfinder) resembles material more reminiscent of M. Night Shyamalan (The Sixth Sense) than anything Scorsese has done, but the execution is completely classic Scorsese. This is a film in every sense of the word with its precise editing and shiny cinematography. Watching the film unfold, the viewer is aware of a sense of impending doom. All the cinematic troupes of a thriller are there: stormy weather, the criminally insane, conspiracy theories, a tortured protagonist, and more. Something is clearly wrong with the events we see unfolding. The music adds suspense and an ill feeling to the film's unnerving tone. The gentle use of flashbacks to WWII are beautiful and engrossing as Scorsese carefully, yet slowly, releases the narrative of the picture in a way that confounds the audience. The feeling of eeriness permeates every scene. Leonardo DiCaprio does some of his finest work as an absolutely tortured U.S. Marshal. The supporting cast is uniformly strong. Mark Ruffalo (Zodiac) is particularly at ease as DiCaprio's partner who grounds the plot in a straight man sort of way as the madness and chaos breaks out around them. Ben Kingsley does fine work as the head psychiatrist of a mental asylum for the criminally insane. Particularly creepy and compelling is Michelle Williams' (Brokeback Mountain) performance as DiCaprio's deceased wife in flashbacks and dreams sequences. Her blonde, vibrant presence is eerily creepy and offsetting. The plot mechanics become very obvious and the twist and turns are seen coming, but the execution is superb. The reasons for the appearance of the U.S. Marshals on Shutter Island become secondary to an overall mystery that permeates the film's narrative. What the mystery itself is becomes the forward motion of events and not what we immediately thinks will consume the plot. No new ground or territory is covered with the predictable plot but the way its told is wholly and completely assured, if not entirely original. The press material, clips, and trailers give far too much away and anyone familiar with the genre can see the plot mechanics working. Also, as the conflicts arise in the momentum of the plot, it becomes clear a certain crossroads and intersection of characters, back stories, and narrative must resolve themselves in order to reach the final act of the picture. 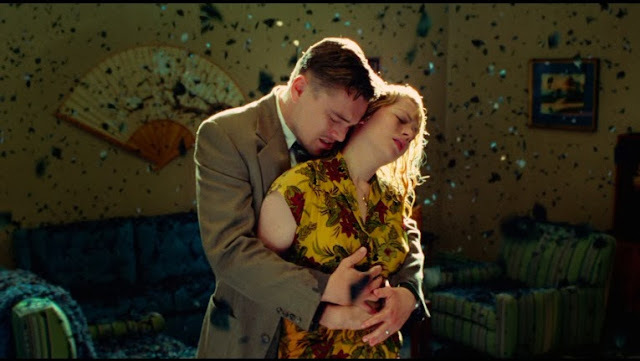 The sheer amount of exposition and explanation within Shutter Island should make it laborious and long, but the way the information is relayed is bold and tense, told in interesting ways reminiscent of film noir and the classics. Scorsese uses genre filmmaking to effectively tell this story. The care and patient direction and storytelling clearly elevates this pulp material into higher fare. Shutter Island rests mostly on the compelling performance by DiCaprio as a tortured officer as well as Scorsese's masterful direction and largely succeeds by treating this material, considered lesser in someone else's hands, with care and respect and lets the mystery unfold naturally of its own volition without gimmicky scares or tricks. As a dark, psychological venture, it works and works well.